This week I became a British ‘citizen’. While waiting to affirm my allegiance in the official citizenship ceremony, and like so many times in recent months, I thought about what this new status meant for my rights and my identity. But, also like so many times before, I thought about the many people trapped in liminal spaces, existing but without being recognised, unable to move or stay, asked to fill out papers that will be rejected, pushed into bureaucratic labyrinths that can return them from where they escaped. Fellow human beings who, like me, were born in any part of the world by accident. Like me, with hopes and dreams. Where do we belong? And who decides it? For some, these are rather philosophical questions. For others, literally a matter of life and death. And, in between, a myriad of struggles, sometimes endured in the privacy of one’s silent journey through life, others through collective understandings, often invisible, or perhaps turned into social movements of resistance, claiming for the right to be – to belong. These are the questions, the spaces, the lives, the injustice that Who Are We?, a collaboration between The Open University (OU), Counterpoints Arts and Stance Podcast, helped to make more visible through combining arts, activism and academia at the Tate Exchange. A symposium on hostile environment policies against migration and the politics of un-belonging shed light on what these policies mean for people’s lives and for democracy. Through the presentations and lively discussion, the members of the panel showed how the overarching headline of ‘hostile environment policies’ translates to have a varied impact. It can mean you are denied free healthcare in the middle of your cancer treatment, which happened to Mo, a member of the Migration and Asylum Seekers Forum. It means that as a woman facing domestic violence you might be denied accommodation but offered a flight ticket home (even if the law doesn’t allow it), as Sandhya Sharma from Safety 4 Sisters explained. It means the tools and support to seek legal aid are being stripped away. It means you lack voice, are disconnected and isolated from those campaigning for you whilst you are in a detention centre. It means asking doctors to become police, which Docs Not Cops is campaigning against. It means hate violence perpetrated by authorities, as Monish Bhatia from Birbeck University described. It means that the immigration policies are shown as separate from, but actually part of, systemic racism and neoliberal policies, intersecting and reinforcing patriarchy and heterosexual hegemony. It means you escape war legally but your status is then taken away, like 70% of the Syrian population in Lebanon, as explained by Syrian activist Leila Sibai and stated by Human Rights Watch (2017). As OU academic and activist Victoria Canning said, “there is a lot to be concerned about, and a lot to fight against”. I have always wondered where I belong. I have felt both privileged and an underdog, and many spaces in between. I have learnt that migrating comes with endless longing for something, no matter how privileged in your new home. I have learnt not to take any of my rights for granted and that belonging is an endless struggle. But I have felt privileged after all. I have always had a safe, private place to stay, and warmth, and food and water. I have never been denied free access to quality healthcare, or education and, with it, the essential driving force that learning is to me. I have crossed many borders many times, comfortably, knowing well I could return. There are millions, however, that have not had this experience – forced to make impossible choices, trapped, illegal, unwanted, dehumanised, in constant fear, too close to death. And, as I became a British citizen, this week has been a stark reminder of the injustice and systemic oppression faced by many whose worth is questioned every day. If citizenship is more than a legal status, if it is also care for your neighbour and to be part of a community, as was indicated in the citizenship ceremony, then it is also a responsibility to engage in practices of solidarity. It is to report, resist and change the policies, the laws, and the everyday racist and patriarchal practices that normalise this hostile environment. Theresa May’s speech at the Conservative Party conference elaborated her plans to ‘transform Britain into a Great Meritocracy’. She stressed the unfair division between ‘a more prosperous older generation and a struggling younger generation’. A major study has just shown that the 1980s generation are already half as wealthy as their 1970s peers. One of the factors most damaging to young people’s income prospects is an early period of prolonged unemployment. The recessions that followed the Global Financial Crash of 2008 brought unprecedented unemployment levels amongst 16-24 year-olds in the UK. The latest Office of National Statistics (ONS) data show that the subsequent slow recovery in youth employment may be faltering. About 30 per cent of 16-17-year-olds who are not in education, employment or training (NEETs) have been recorded as unemployed over the last two years, and last month’s figures show a new high of 35 per cent (which is likely to have risen further since the summer). But if the law was being adhered to, no-one aged 16-17 should be unemployed or NEET. The Education and Skills Act 2008 requires every 16 and 17-year-old to be in full-time education or training, or in full-time or part-time work that includes release for regular training. The one part of the parliamentary debate about the Act that triggered objections concerned the sanctions that apply to those who contravene its requirements – especially sanctions which would place them in detention centres for persistently refusing to comply. The Labour government rejected these concerns and forced the legislation through, but in 2011 the coalition government suspended the clauses which required Local Authorities and employers to monitor attendance and punish refusal. Participation remains compulsory, but it has never been enforced. Why? Conservative and Liberal-Democrat MPs had raised high-minded objections to the Act. They argued that 16 and 17-year-olds, who are legally deemed mature enough to marry, bring up children and serve in the armed forces, should enjoy freedom of choice not to participate in any form of education or training (or work). But the coalition’s reassertion of these principles coincided conveniently with its ‘austerity’ policies: monitoring and enforcement would have been far beyond the capacities of shrunken Local Authority budgets. The effects of non-enforcement have been predictable. Department for Education figures for 2015 in England show that the numbers of 17-year-olds who were known to be NEET were exceeded by the numbers of ‘not knowns’ who had in effect ‘disappeared’ from Local Authority records. Last year the House of Commons Public Accounts Committee estimated that the ‘participation’ statuses of more than 100,000 16-18-year-olds were unknown. Prioritising 16 and 17-year-olds’ supposed ‘freedom of choice’ releases the state from some long-established commitments to their welfare. This is troubling when their limited chances of getting a job, earning a genuine living wage and being able to afford somewhere to live are left to ‘the market’: the Low Pay Commission has shown that the real earnings of 16-17-year-olds fell by 17% between 2009 and 2013, and their median hourly pay fell by more than £1 to £5.03. All in all, the youngest adults’ freedom of choice means that many of those who have gained least by way of skills and qualifications from 11 years of compulsory schooling face stark choices between unemployment, poverty-level wages and extending an unproductive school career. At this point, ‘disappearing from ‘officialdom’s’ view’ is the most rational and appealing option for many of them – one that is lent apparent legitimacy by the government’s indifference to enforcing the law that requires them to ‘participate’. This version of freedom of choice is self-evidently one with tangible consequences for future financial (in)security and prospective poverty. If the current government is serious about the Prime Minister’s commitment to tackling intergenerational inequality, it must break the silent consensus which the coalition allowed to evolve between young people who believe their best option is to ‘disappear’ themselves, government departments that are content to accept their invisibility in official data, and Local Authorities that are forced to ignore it for lack of funding. Policies that veer between the ill-advised and socially unjust extremes of criminalising young people for ‘being NEET’ and colluding with it are no path to any kind meritocracy – least of all a great one. A number of the themes of the article are developed in: Fergusson, R. (2016), Young people, welfare and crime: governing non-participation, Bristol: Policy Press. 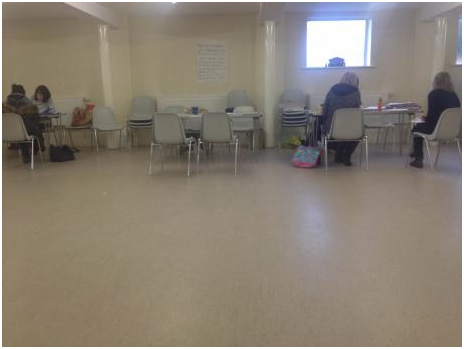 Rough sleepers in policy and practice: chaotic and off course, or misunderstood? Since 2010 the number of people sleeping rough has increased year-on-year, according to official estimates. Historically, rough sleepers have been the subject of national government policies, which have made distinctions between ‘deserving’ and ‘undeserving’ individuals. However, more recently, government policies have also employed other terms to describe rough sleepers’ lives. Terms such as ‘chaotic’, ‘off track’, and ‘off course’ have been mobilised in policy framings of rough sleepers’ lives. These policy terms suggest a particular way of understanding the lives of rough sleepers – as disorganised, abnormal and headed in the wrong direction. But, to what extent to these reflect the experiences and understandings of rough sleepers themselves? One way to consider this question is to explore rough sleepers’ accounts of their own lives, an approach I take here, drawing upon work undertaken for my PhD. In that research, I spent nine months in homelessness services, talking to people who had slept rough. I also interviewed 17 people who identified as having slept rough or having had no accommodation over a period of nine months. Within the research, life mapping was a tool employed to assist rough sleepers in creating visual and verbal accounts of their lives. 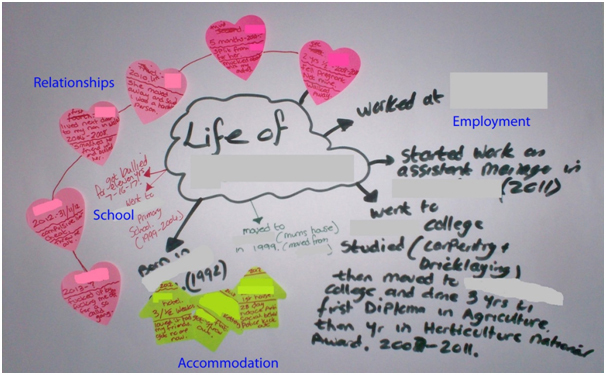 Life mapping allowed rough sleepers to draw their story whilst also describing it. Below are two examples of the life maps created in the research. These maps are visual representations of rough sleepers’ lives. As is visible from Kelvin’s life map, he did not see his life as ‘chaotic’, but rather, as orderly. 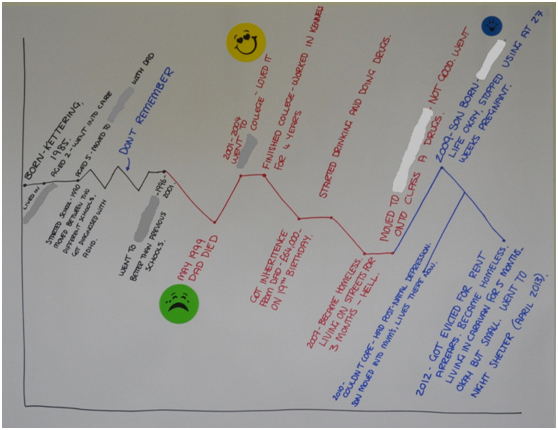 Kelvin divided his account this into four main topic areas – schooling (left centre), employment (right), relationships (left) and accommodation (lower centre). Within Kelvin’s account, stories of successes and disappointments were evident. Samantha’s life map also showed order in her life. Like Kelvin’s, Samantha’s map also shows a life which is not ‘off track’ or ‘off course’. This is visible in the line drawn between key points in her life, showing both high points and low points in her story. These life maps show visually the order and mixed successes of rough sleepers’ lives, which stand in contrast to the claims of ‘chaotic’ and ‘off track’ lives made in policy. As Jane’s and Laura’s accounts both show, making long-term plans when experiencing homelessness can be difficult, due to the possibility of circumstances changing without warning. Thus, short-term, but orderly planning, often provided a more rational way to navigate through the conditions of being homeless. So, what does all this tell us? Whilst policy documents talk of rough sleepers in ways which still echo distinctions of deservingness, recently they have also spoken of rough sleepers as having ‘off track’ or ‘off course’ and ‘chaotic’ lives. 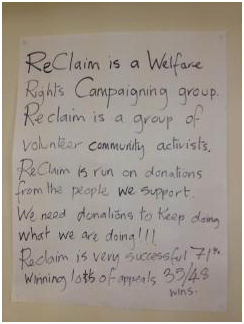 However, rough sleepers themselves talk of their own lives not as ‘chaotic’ or ‘off track’. Within their accounts, rough sleepers highlighted the difficult conditions and circumstances which being homeless carries. They described attempts to manage these, employing various strategies and attempts to maximise the limited means and resources available to them at the time. These are essentially ‘management tactics’ – and while they may initially appear ‘chaotic’ or ‘illogical’ to outsiders, understood in context they reveal themselves as being rational. As such, whilst policy makes judgements about rough sleepers’ lives as being ‘chaotic’ and ‘off track’, these often misunderstand the lived experience of sleeping rough. Instead, a policy strategy which recognises the importance of individual context and experience, and supports the use of personalised rough sleeper-led approaches, could provide a successful platform for understanding the experiences, strengths, and self-defined needs of rough sleepers, and could be key to reducing repeat homelessness. *All location, service, and individual names have been changed to protect the identities of those involved in this research.